I wonder how others relate to the ease with which Lazarus folds the American experience into her prophetic vision for the Jewish people. Yet there is a way in which the expansive reach of her poem is entirely appropriate for Rosh Hashanah, a day that the sages associate with the “birthday of the world.” For Lazarus, the Jewish New Year is part of the fabric of the universe, and thus when the leaves on American trees burn with color, they burn in a way that announces God’s kingship on earth. 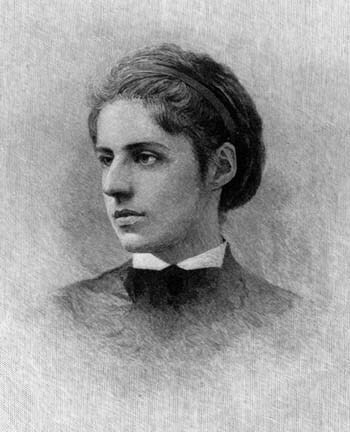 It is interesting how Emma Lazarus here conceives of Jewish immigration to America in parallel spiritual terms to immigration to Israel. It seems wrong to me personally to attempt to infuse Jewish communal life anywhere but Israel with this specific type of religious significance – i.e., that which emanates naturally from the connection between Jewish communal life and the geography of a particular place. However, if one is going to do so, Lazarus here presents a relatively benign model whereby the significance of Aliya (as it were) is not somehow diluted in the process.